Retailers have become highly efficient in terms of utilisation of space and their warehouses have become larger and detailed. Warehouses are now more technologically oriented and help in linking stocks with the retail store in an accurate way. Warehousing is an indispensable part of supply-chain management. Setting up a warehouse demands a certain amount of space as it deals with stocking of all the merchandise. Retailers usually set up a central warehouse and many regional warehouses. The regional warehouses help in timely order fulfillment at stores across the country. Warehouses are set up at locations on the outskirts of the city where it can get maximum amount of space required at a lesser cost as compared to setting it up inside the city. The property prices start coming down once you start moving away from the city limits. They generally vary from 1,000 sq. ft to 10, 00,000 sq. ft. Investment requirement for constructing a state-of-the-art warehouse with all the essential requirements costs somewhere around Rs 3,000/sq. ft. The purpose of setting up a warehouse is to have a place for the storage of goods which cannot be kept in the store but can be required at any moment. An efficient ERP system is required which keeps the whole team connected. All the stocks can be seen at the company head quarters, all warehouses and stores. The database managed at warehouses provides useful reports about the status of goods at the warehouse. The progress of products in the warehouse is monitored which involves physical warehouse infrastructure, tracking systems and communication between product stations. There are certain aspects that need to be taken care of to ensure that the company has state-of-the-art warehouses. Certain facilities like round the clock electricity, water supply, fire detection and fire fighting system, smoke detectors, CCTV etc. There should be ample space for the parking of trucks and other transportation vehicles. There should be a heavy duty racking system and conveyor belts from picking to packing to the staging area. There should be an availability of the handling materials and the implementation of proper warehouse management systems. The warehouse should be big enough to accommodate an administration/office, dispatch office, site office and area for the drivers etc. Quite a few brands have set up their own warehousing facilities to make the process more viable for them. The positive part of in-house warehousing is that it is directly under the supervision of the company. Other than that there are also some disadvantages of outsourcing warehouses, control losses and information systems may not web. However we also find brands that have outsourced their warehousing needs to 3 PL (Third party logistic) players. They feel that the set up and management costs are lowered and the 3PL are professionals who can manage the process very efficiently. If the 3PL partners are professional and can manage things well then outsourcing brings in a lot of benefits to the retailer. 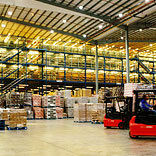 Warehousing is an essential part of the supply chain process undertaken by a retailer. With time, necessary and appropriate changes need to be made to keep the warehousing needs up to date.